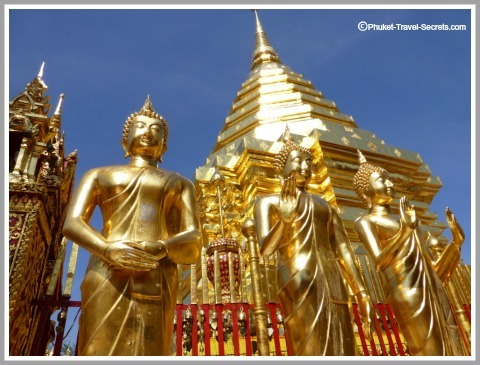 Wat Phra That Doi Suthep is a must see attraction in Chiang Mai. Not only will you get to see this impressive Buddhist Temple but you will also get to take in the spectacular views of Chiang Mai. 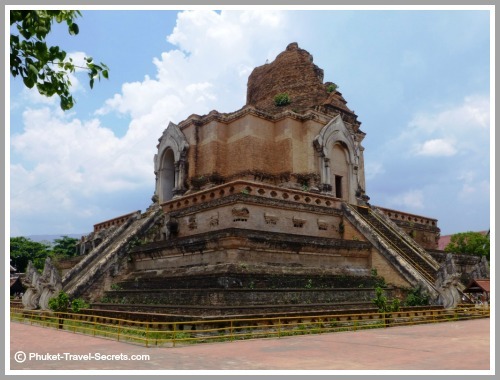 Chiang Mai is the perfect destination in Thailand if you love Buddhist temples; the city is literally oozing with them and deciding on which temples to visit can be somewhat overwhelming. If your time in Chiang Mai is limited like ours was, we would suggest that your first stop be a visit to Wat Phra That Doi Suthep. Wat Phra That is one of the most sacred temples in Northern Thailand and a popular destination for both Thais and tourists alike. 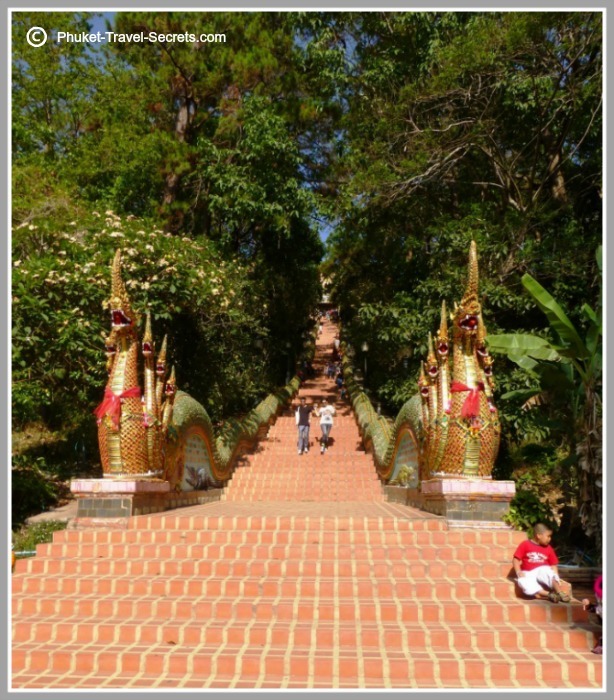 On arriving at Doi Suthep you will have the choice of walking up the 309 steps of the Naga Serpent staircase or alternatively catching the cable car to the temple grounds. 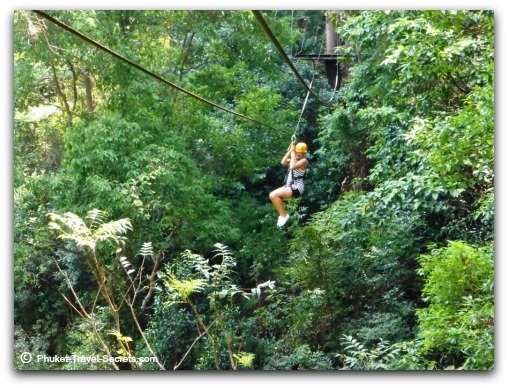 Depending on what the temperature is and your fitness level will determine if you want to take on the stair climb, or opt for the less strenuous option and pay the small fee to ride in comfort on the air conditioned cable car. After doing the stair climb ourselves, my suggestion would be to take the cable car up and the stairs back down. Once at the top and inside the temple grounds, you can’t help but notice the impressive Golden Chedi which takes centre stage. The perimeter of the Chedi is decorated with shrines, Golden Buddha statues and ceremonial parasols. 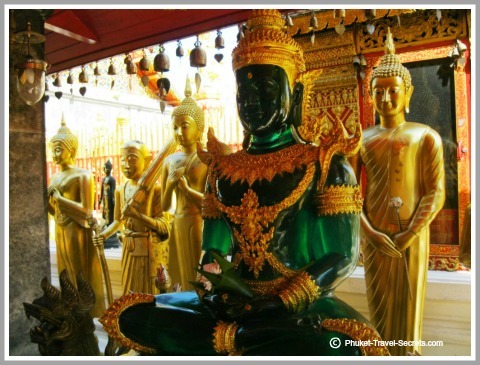 Amongst the Golden Buddha Statues is this beautiful copy of the Emerald Buddha Statue. Take a walk around the temple grounds and have a look at the statues and inside the temples, taking note of the murals painted on the walls, if you like you can also be blessed by the monks. 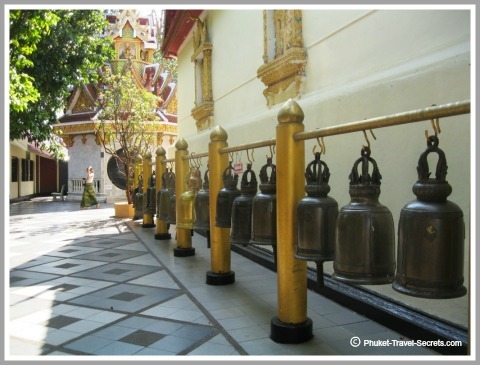 The lower terrace of Wat Phra That is surrounded by large bells, it is said that if you ring these bells they will bring you good luck. 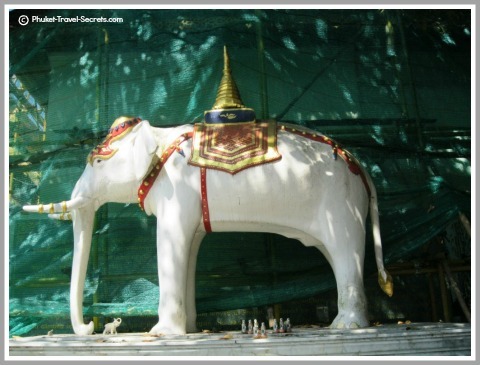 Located on the northwest corner of the lower terrace you will find a statue of the legendary white elephant and the story of how the temple at Doi Suthep was founded. Before making your way back down the stairs, don’t forget to take some time to take in the views of Chiang Mai from this elevated position. On your way back down the stairs you will see stalls and market where hawkers sell their wares. 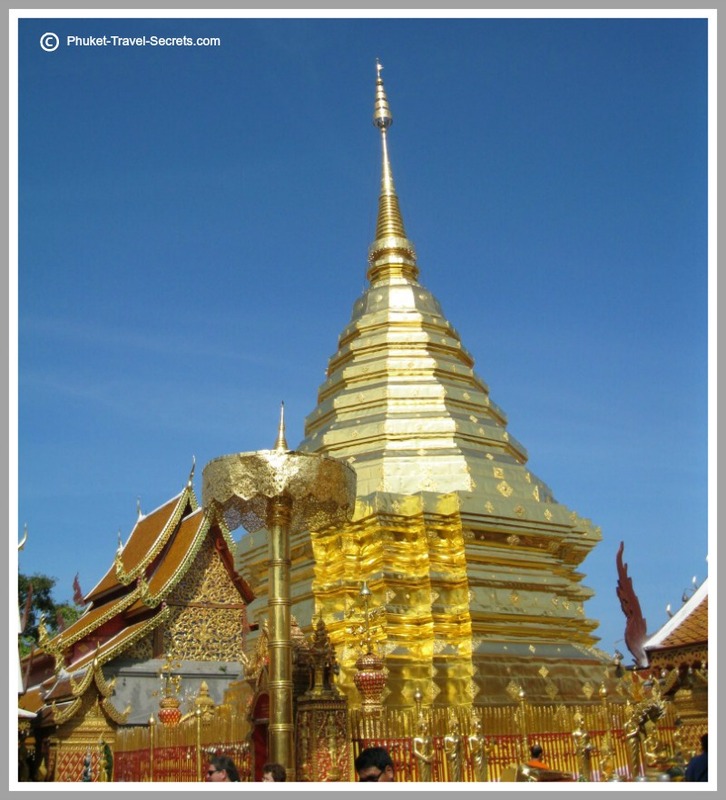 The best time to see Wat Phra That Doi Suthep is either early in the morning or mid to late afternoon. 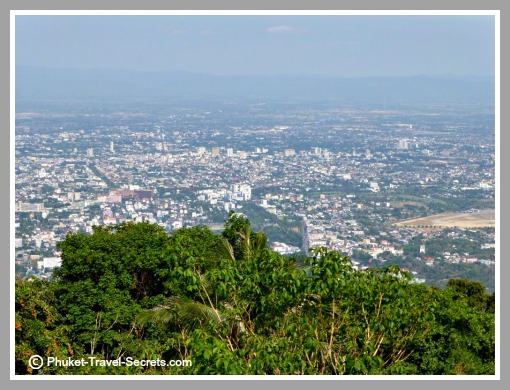 The day of our visit we were blessed with clear blue skies, which made for spectacular views of Chiang Mai. Wat Phra That Doi Suthep is a picturesque 30 minute drive from Chiang Mai City, the drive up to the temple is somewhat challenging with steep inclines and windy roads but very scenic and definitely worthwhile. 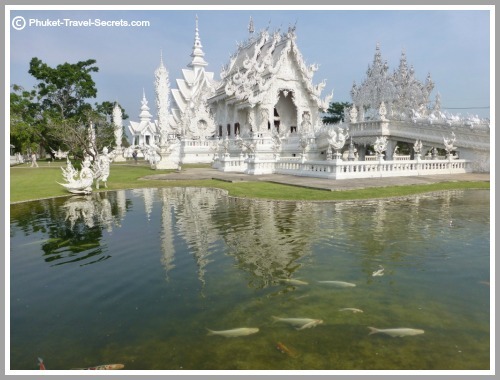 We hired a car for the duration of our stay in Chiang Mai, as we wanted to visit Wat Rong Khun in Chiang Rai and to take a drive up to the Golden Triangle. 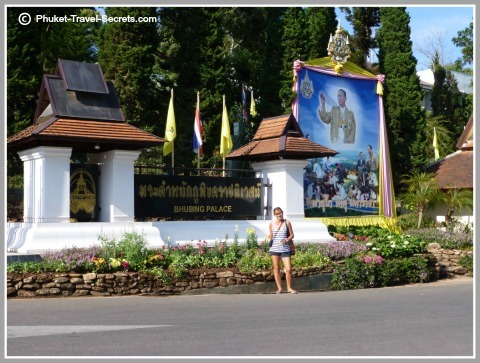 If you don't want to a hire a car or motorbike, you can catch a songthaew or alternatively there are day trips that you can book. If you decide to hire a car or a motorbike there is ample parking in the car park at the base of the temple. When visiting any temple you should dress appropriately. I always carry with me a sarong and a light cotton long sleeve shirt to throw on over my clothes before entering any temples. There is an entrance fee of 30 baht if you climb the stairs. Or 50 baht if you decide to bypass the stairs and ride the cable car. The temple is open from 6.00am to 8.00pm daily. 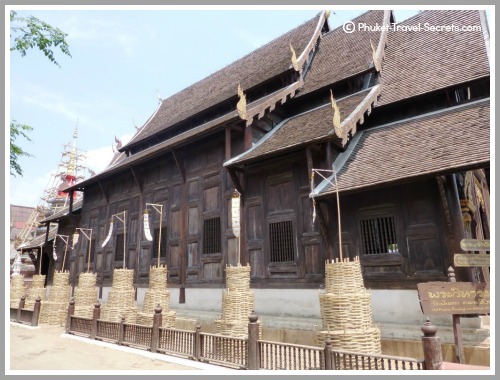 Located just a few kilometres from Wat Phrat That, is Bhubing Palace, the winter residence for the Thai Royal Family. The Palace grounds are a treat for nature lovers and garden enthusiasts with beautiful flower gardens to explore. The Palace is open to the public most of the year except when the Royal Family are in residence, which is usually from January through to March. Bhubing Palace is open from 8.30am to 11.30am and from 1.00pm to 4.30pm. Note: From 11.30am until 1.00pm the Palace is closed.